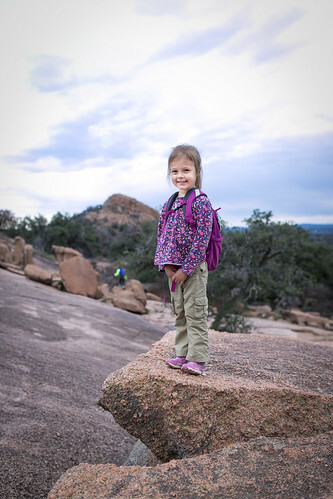 There are numerous extremely fun places to visit near our home in Central Texas. This year we decided we are going to try to explore way more of these areas than we have in previous years. Abbey is now at the age where she can hang with us. We can hike for miles and miles and she doesn't complain. Her little legs can keep up well. 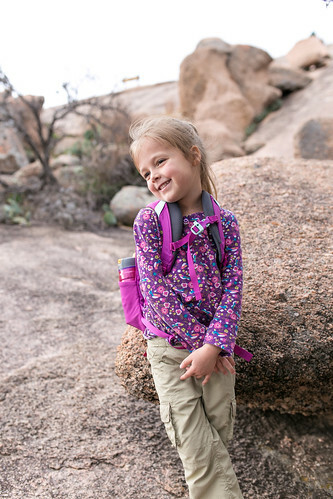 Can you believe she has hiked up to 5 miles at one time with her little legs? 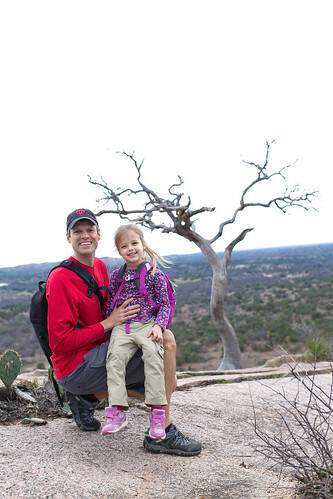 The kids are now loving hiking almost as much as we do. This was a huge goal for us. 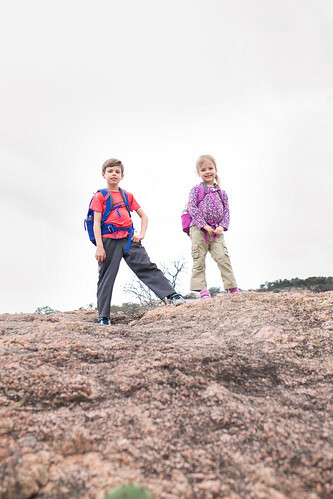 Since we are at such a good point with the kids' loving adventure and outdoors as much as we do, we decided it was time to take a day trip to Enchanted Rock. 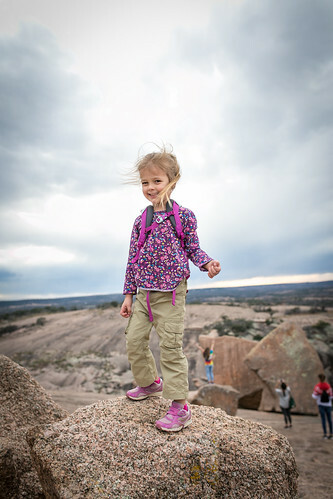 Enchanted Rock is a "state natural area" just outside of Fredericksburg, TX. 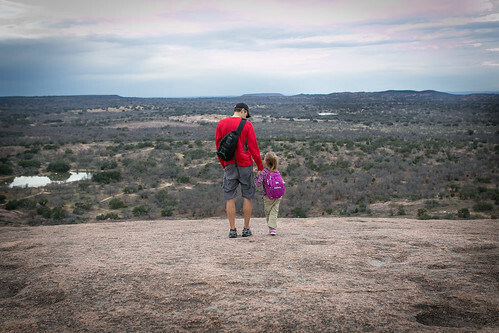 The massive pink granite dome rising above Central Texas has drawn people for thousands of years. 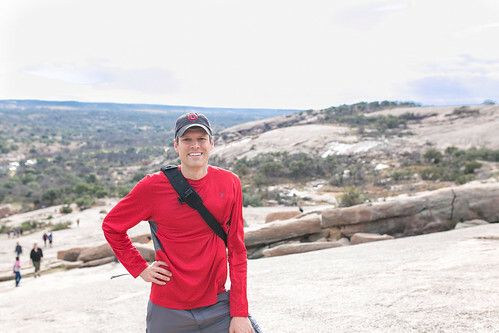 The scenery and cool rock formations make it a really fun place to explore. 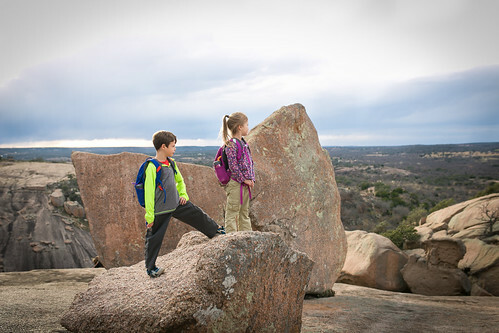 Our kids absolutely love rocks. 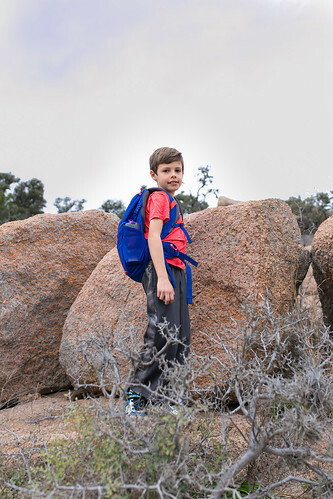 They collect rocks, they love to climb rocks, and they love to look at others' rock collections. So, this trip was right up their alley. 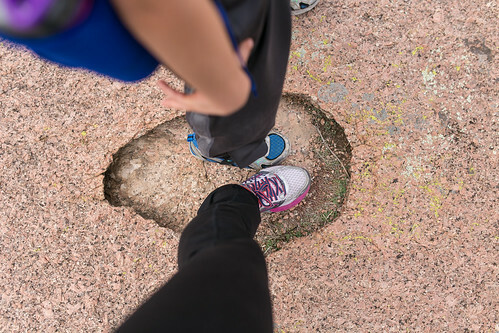 The last time that Drew and I visited Enchanted Rock was when we were dating. It was July and it was HOT! 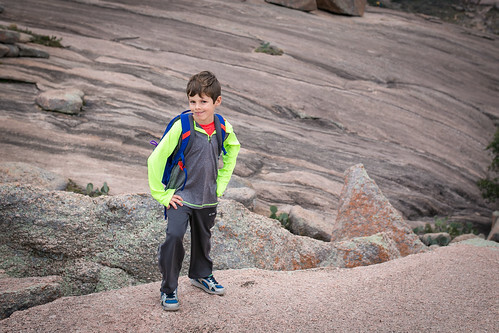 Probably not the best time to be hiking to the top of a massive piece of granite. But, we still had fun. We didn't remember it being very busy. But, then again, it WAS July. 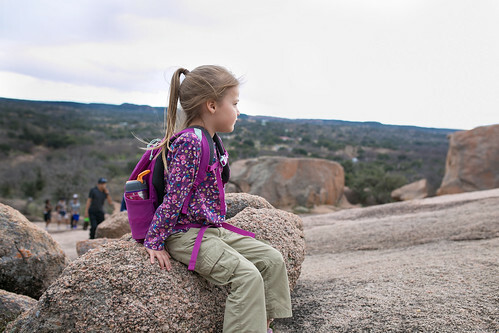 Our trip back in 2007 to Enchanted Rock. We were very hot and sweaty but still smiling. We got back to E-Rock around 1:20. When we arrived, the park ranger again told us that we could not go in until 2pm. So, I asked what he recommended we do in the meantime. 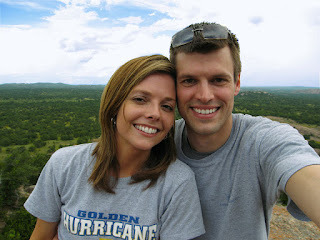 He said go to Fredericksburg or Llano. I told him that we had already been by before 11am and were told they didn't open until 2p, so we had already been to Fredericksburg. We asked if there was somewhere we could park and wait. He said that once we got beyond the cattle guards on either side of the park, they couldn't stop us from parking on the side of the street. He said that they allow folks to start lining up 5-10 minutes before 2pm for entry into the park. So, we decided to drive down a ways until we saw other cars waiting. It was crazy! There were so many vehicles parked along the side of the road. Eventually, a Texas parks truck with flashing lights came by and asked everyone parked along the side of the road (within the cattle guards) to leave. We decided to drive a little further just past the cattleguards and park there. There were many cars doing the same thing. We waited there for about a half hour and started heading back to the park to get in line at 1:50. We were actually the first car to leave the area. Others still were parked. When we arrived, the line had already begun and there were about 50-60 vehicles in front of us! The line went on for what seemed like miles. We were nervous that we would spend another hour waiting and never be able to get into the park. 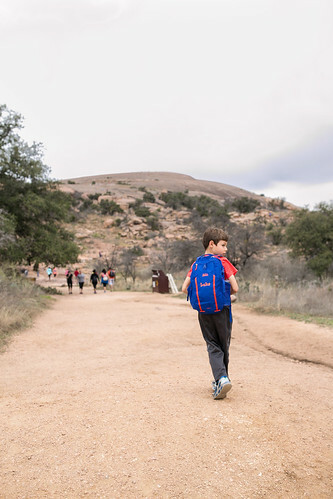 We considered heading back towards our house and just visiting Pedernales Falls on the way back instead. But, we discussed and agreed to stick it out. 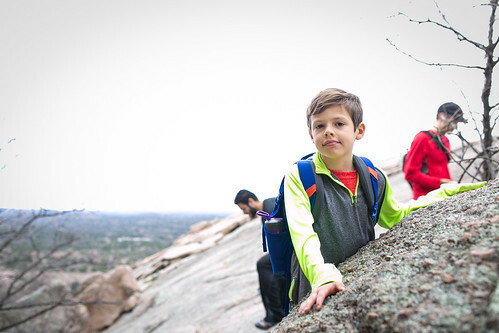 The kids were SO excited to climb E-Rock. Finally, a park ranger came by to help direct traffic (it was crazy y'all!) and we asked him if he thought we would be able to get in based upon our place in line. He responded, "you'll get in!" We were elated to hear him say that. The next 45 minutes went by pretty quickly and we were in the park. By the time we got into the park, Drew and I had invented a much better ticketed system for entry into this popular park. 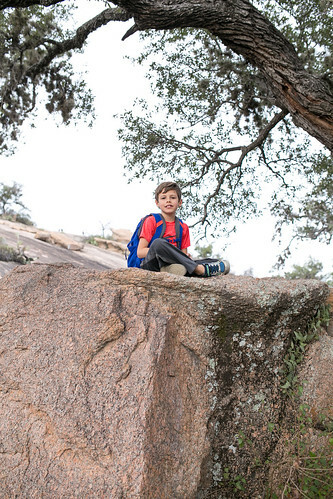 Maybe we should write the Texas Parks Department. I write all of this information in hopes that others read this and avoid some of the waiting time that we did. In the future, we would get to the park at least before 9:30a, preferably before 9a. That would have saved a lot of trouble and wasted time. Also, once you get to the pay station, if you pay with cash, you can stay in your vehicle. Those who were paying with credit card had to park and then go inside to pay. This is why the line was taking so long to move forward once the clock turned 2pm. Thankfully, we made sure to have exact change and that part was a quick process for us. Once we got in though, we really did have a blast! Here are some pictures of our lovely and delightful visit to the park. The Summit trail begins like this, with a gravel path. 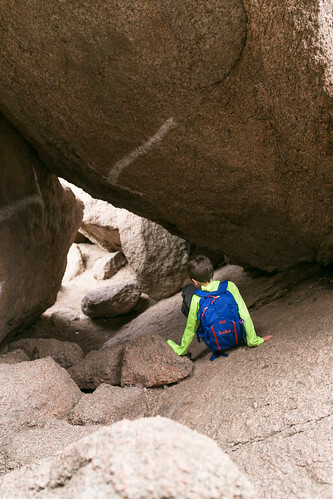 But soon, the path is gone and you just make your way to the top of the big rock whichever way you wish. 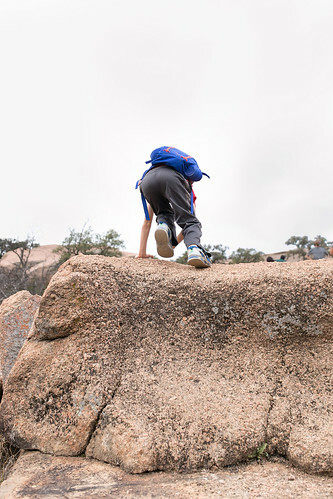 The kids loved climbing on all the fun rocks. 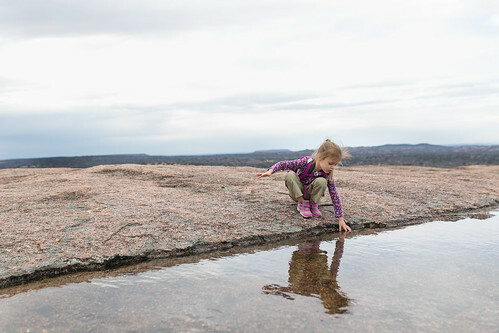 Enchanted Rock is basically a HUGE piece of granite. 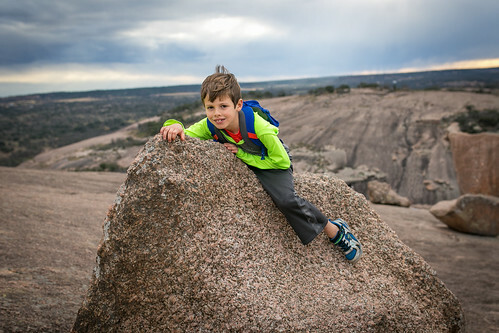 There are SO many fun rocks to climb! It's a climber's dream!!! And Luke is most definitely a climber!! I love the textures and flora there. 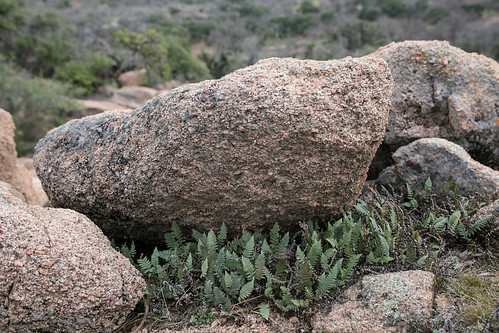 The hike is extremely steep, and thus is rated as difficult. So, we took a couple of little breaks on the way up. Luke thought this was a perfect spot to eat a snack. We decided to eat a snack there on the way back down. Luke was always our leader (as usual). He was extremely excited the entire time and I am pretty sure this was one of his favorite hikes so far. He scoped out the area ahead and told us which way we should go. There are gorgeous views from every angle! You can tell the hike up is pretty steep. 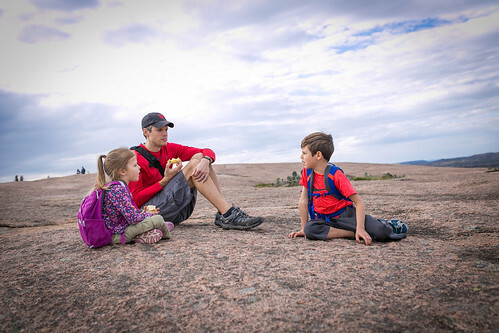 We promised the kids that when we made it to the top, we would sit down in a pretty spot and have a snack. We ended up going over the top and to the other side of E Rock for some gorgeous views. 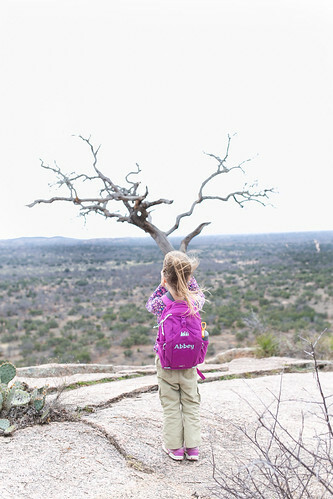 Abbey could have stayed there forever, taking in the views and chatting with daddy. Luke and I finished our snack quickly though and were ready to explore some more. We found this. 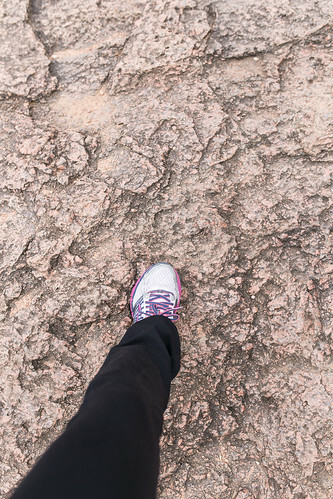 Luke and I pretended this was a dinosaur footprint. 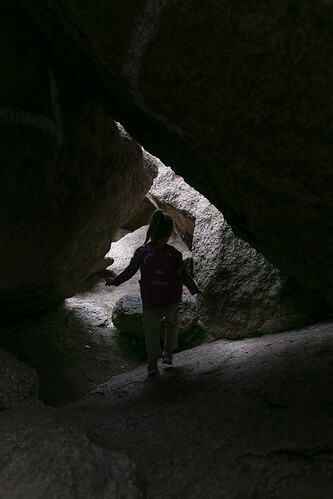 After our snack, we found some fun caves to explore. 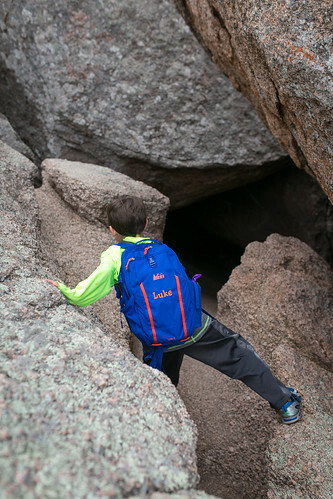 We crawled between some fun, huge rocks to get to the cave entry point. 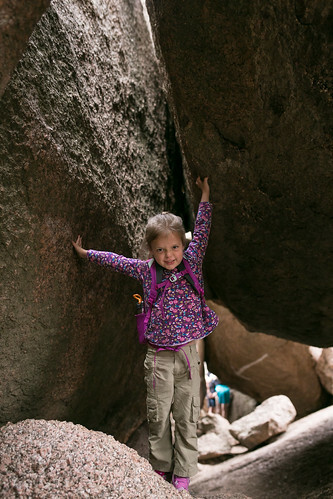 Abbey held these big boulders up so we could all squeeze through. I include this photo to show the steepness of the hike. This photo is taken at a straight angle. 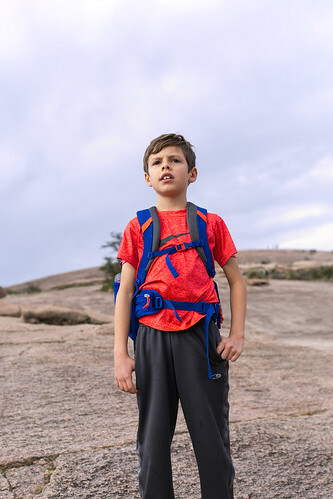 A few times, Luke was a little bit afraid he was going to fall off the mountain since it was so steep. We could feel the cool, damp air coming from the cave. It was so much fun to explore all of these neat areas together. 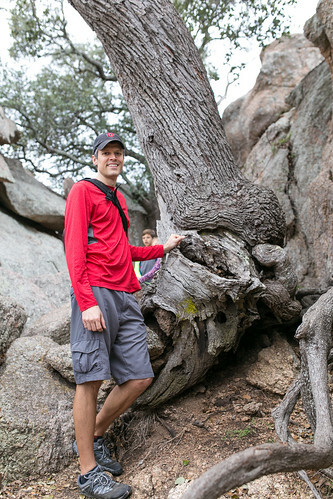 The trees that lived on top of E Rock were really fun to look at and explore. Abbey agreed with us that this lonely tree at the peak was awesome. So, she pulled her camera out and snapped a photo. One side of E Rock had some big pools. The pools were extremely shallow. 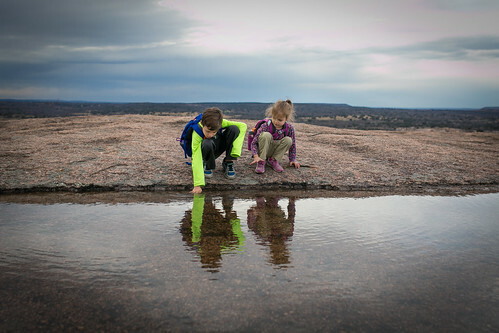 While the kids explored them, the photographer in me loved the reflections and the beauty and just had to snap pictures. 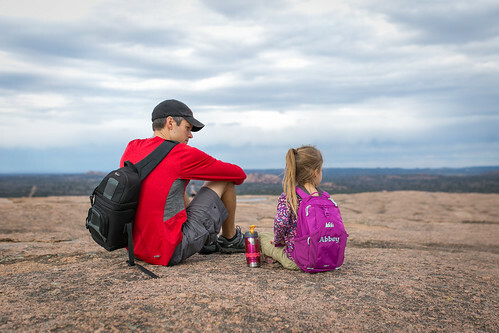 We enjoyed views from every angle of E Rock. The striations created from previous rains and dirt were absolutely gorgeous. 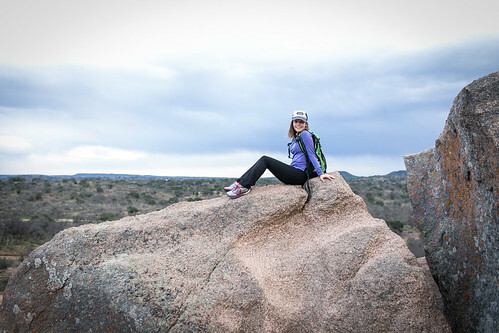 We found so many fun rocks to climb. This was a comfy place to hang out. 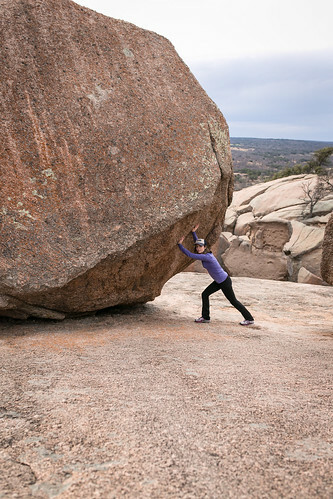 I did my part by moving some big boulders back into place. I found the perfect place to set the camera down to snap a family photo. 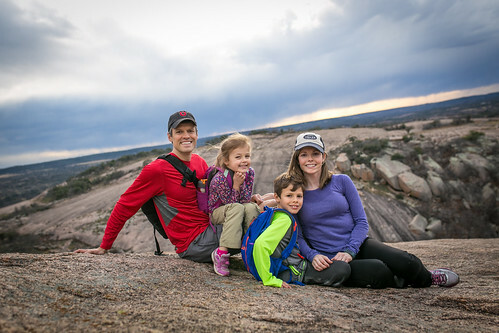 Too bad it was so windy on the top, otherwise without the hair in my face, this would be a good family photo to print. As we were waiting in the car for what seemed like hours before getting to enter the park, Drew and I had told the kids that this may be the only time we visit the park. 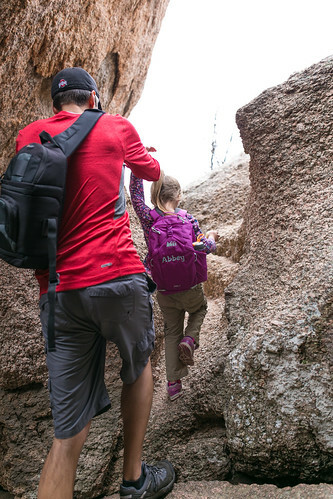 We just couldn't imagine going through the frustration of getting into the park again. But, it is amazing how the experience once inside the park helped us to forget about all of that pain and frustration we experience before entry. Now, I am certain we will be back again someday. Perhaps we will camp there so we can spend more time. But, I will go back to my normal ways if we do so and plan, plan, plan. Make reservations many months ahead. Or, if just a day trip, arrive just after the park opens, spend the morning there, and then head to the cute German town of Fredericksburg for shopping and food afterwards.